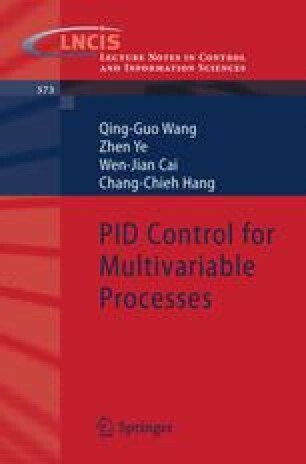 In the previous two chapters, design methods for multivariable PID control have been demonstrated based on IMC and dominant pole placement, respectively. They are in line with traditional design methods commonly used for process control and are broadly accepted in practice. On the other hand, most of the developments in the modern control theory have not been applied to PID control due to their complexity or inconvenience of use. It is our wish to bridge the modern control theory and the industrial control practice which could benifit from the advancement in the former. This chapter aims to make an initial step towards solving this problem. The basic idea is to transform the PID control to the equivalent static output feedback (SOF) control by augmenting to the process with some new state variables induced by the PID controller such that the well established results in SOF field can be employed to design a multivariable PID controller for various specifications such as stability, H2/H ∞ performance and maximum output control.